The Best Shark Dive in the World! : Swamped! 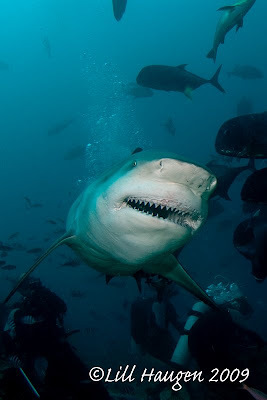 Actually, this is the very moment when our Bull Sharks are at their most harmless! This Shark has just taken the bait and is swinging out from the pit whilst munching on a Tuna head - a funny thing actually, as some individual Sharks just swallow the heads whilst others, like Crook, Bumphead and Chopper always engage in this particular behavior. Anyway, with their mouths filled to capacity, they could not be less interested in the (happy) photographer! As I said, Lill's portfolio will be impossible to beat! Thing is, we're being swamped! Whereas only a couple of years ago, a dozen Bull Sharks would have been a great dive, now we're talking 25-30 and on exceptional days, more than 40! Not counting the Tigers, Silvertips and Lemons who can swing by anytime! This of course has yet again led to an overhaul of our safety procedures. Not concerning the customers who continue to be completely separated from, but still very close to the animals - but concerning the feeders! Keeping track of what's going on whilst concentrating on feeding has become next to impossible and we've had to second two bodyguards who are positioned next to the bin and ensure that everybody continues to behave! All very exciting and loads of fun! Lynch Mob at the Gate! Global Warming - Dogma? Religion? Conspiracy? YoSF - We have a Patron! Animal Planet - F@#$%ing Morons! Great Entertainment - for less than 5 Bucks! Sasha: Thank You and Well Done!